Serve your drinks on the rocks?actual rocks! ?with these granite discs gathered from New England beaches. Serve your drinks on actual rocks with these handsome granite drink chillers by Arra David and Anne Johnson. 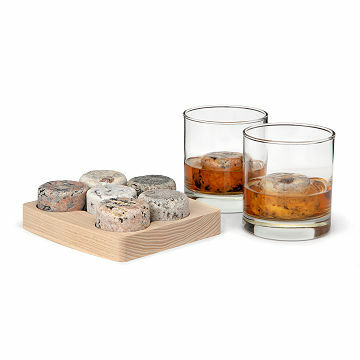 Hand-crafted from stones collected on New England beaches, these granite discs are ideal for chilling aged spirits, such as whiskey or scotch, because they won't dilute the complex flavors like a handful of ice. Simply chill the set. Drop two stones in 1 to 2 oz. of fine spirits, let stand for five minutes and enjoy. Set of six comes in a convenient hardwood tray for easy freezing and serving, with two tumblers to boot! Made in Louisiana of 50% recycled glass. Click here to read benefits and care instructions when using your On The Rocks Set. To use 2 stones to cool is a bit much, especially in a glass of this size. Also stone doesn't retain coldness. Not only are the stones perfect for chilling whiskey, the natural stone colors and the wooden holder are quite attractive in their own right. John will be able to display the stones as a decorator item when not in use. I am very pleased with the purchase. Client was thrilled with this gift! He's a total bourbon drinker and was actually looking for some nice cubes. AmericaÂ´s Customer Service at its best!!! They are so easy to use. They are a subtle attention getter at parties...not over the top, just a bit of class. When we hang out at the house or have family and friends over. First time ordeing from your site and I was very impressed! My dad who lives in another state enjoys a good whisky with his son in law. I figured this would be the perfect gift they could both enjoy.